Fulcrum Concepts leverages a highly skilled and experienced organic engineering team with world class multi-disciplined partners to provide superior products at an exceptional value. Areas of expertise include 3D CAD Design, Structural Analysis, and Airworthiness Substantiation. We pride ourselves on developing engineering solutions for our customers that are operationally effective, light weight, easy to manufacture, and simple to maintain. Fulcrum’s design team excels at designing solutions involving aircraft structure, weapons, launchers, and sensors. 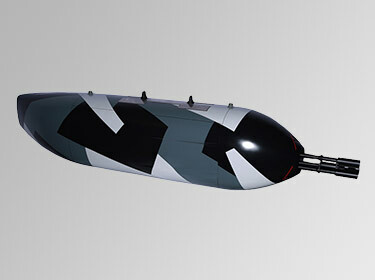 Our design team has extensive experience in multi-functional ISR platform development including articulating doors, retractable sensor arrays, and weapons systems integration. Fulcrum designers have the added benefit of being collocated with operational users, which provides operational insight during the design process. That insight, coupled with comprehensive internal design reviews, minimizes design time, and reduces cost for our customers. 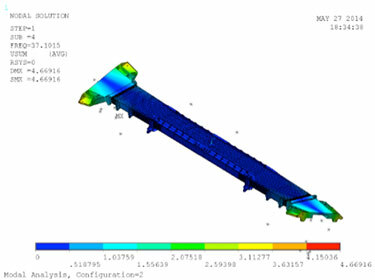 Fulcrum employs world class stress analysts with a broad range of airframe structural analysis experience at major OEM’s and modification facilities. We utilize classical hand calculations and free body diagrams along with Nastran/Patran finite element modeling. Structural analysts are well versed in static strength, structural stability, fatigue, and vibration related design drivers. A coordinated effort with the design team leads to an efficient solution and low program risk. Computational problem solving enables Fulcrum to resolve the statically indeterminate and multi-load path structures with ease. Fulcrum is fluent in static, large displacement non-linear, and normal modes solutions. FEM is a complex interaction of stiffness coefficients that must be managed by highly experienced and knowledgeable analysts. The Fulcrum team leverages a unique blend of classical and computational experience to generate superior analytical solutions for every project. Fulcrum’s electrical designers each have 20+ years of experience and specialize in aircraft wiring, mission equipment wiring, and control head design. 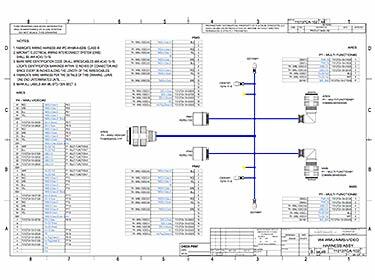 We use E3 Wireworks to generate wiring diagrams, harness designs, and drawings. We have performed complete cockpit redesigns, and comprehensive aircraft Electrical Loads Analysis for fully missionized platforms. 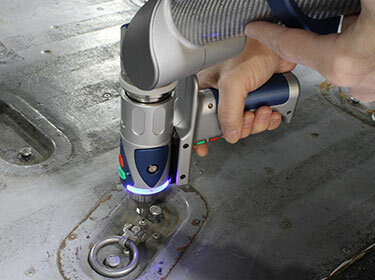 We use multiple tools, to include a FARO Edge to assist us in collecting engineering measurement data when existing data is incomplete. This coupled with a thorough understanding of materials and structures allows us to create efficient designs even if there is no pre-existing data available. 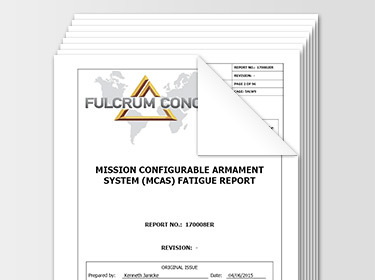 Fulcrum produces data to support airworthiness requirements including, but not limited to: Install/Parts Drawings, 3D Models, Airframe Structural Modification Stress Reports, System Safety Assessments, Material Reports, Mass Properties Reports, Flight and Ground Test Reports, Acoustical Noise Assessments, Fatigue and Damage Tolerance Analysis, Damage Allowable and Repair Procedures, Flight Manual Supplements, Qualification Plans and Matrices, Flight and Ground Test Plans, Maintenance Manuals, Structural Repair Manuals, Fatigue and Damage Tolerance Test Plans and Reports, Functional Hazard Assessments, Assembly Drawings, and System Specifications. At Fulcrum we understand the critical nature of an effective Configuration Management (CM) Program. The heart of our CM system is SolidWorks Enterprise PDM, and an effective work flow process. The Product Data Management software enables the management of files, revisions, engineering changes, and compliance in accordance with our work flow process, which is configured within the EPDM system. Features include: technical and administrative direction and control of design data, control of design changes, management of the design, its parts, its interfaces, and associated documentation, secure storage and indexing of design data, lifecycle history, electronic drawing and design reviews, and a signature approval and release notification process.